The company was established in 1955 as Farkas Barron (Canada) Limited, a subsidiary of Farkas Barron, a New York Consulting firm, under the management of Jerry Jablonsky. From the beginning, the firm provided consulting services for large developments in the Toronto area. The name of the company was changed to Farkas Barron Jablonsky Consulting Engineers in the early 60’s to reflect the growing importance of Canadian management and ownership of the firm. By the early 1970’s, the firm’s capabilities and reputation were firmly established, as being able to undertake virtually any structural engineering design assignment. By 1980, the company’s name was changed to Jablonsky Associates, with Paul Ast and Jerry Garshon being made partners along with Jerry Jablonsky. The firm was then fully Canadian owned. 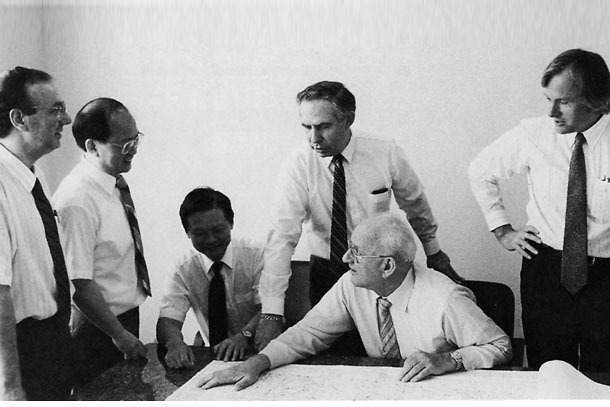 In 1988 to reflect a further adjustment in management responsibilities, the company’s name was changed to Jablonsky, Ast And Partners. Presently, in addition to Paul Ast, Robert Asman, Dominic Tari, Mike Shiu, Jeff Vivian, Jeff Watson and Craig Slama are partners in the firm. Jablonsky, Ast And Partners are structured to provide design and site services for structural projects of varied scope and magnitude. The design department of the firm is divided into several groups of engineers, usually headed by a partner or associate, of the firm, who prepares the design development drawings for the project, and a group of engineers, headed by a project manager, which prepares detailed contract documents for the projects. Site services, such as checking of shop drawings, site inspections, attendance at site meetings and contract administration are provided by a separate group of experienced site inspectors, headed and supervised by a project manager. The drafting of each project is done by a team of CAD operators, headed by the chief draftsman of the firm. The activity of the design department is directed and supervised by the chief engineer of the firm. Jablonsky, Ast And Partners believe that structural deign should be optimized to the needs of interrelated design disciplines as well as to satisfy the requirements for economy and rapid construction. The search for the “optimum” solution requires the development of a number of alternative structural arrangements and materials, to support a detailed cost comparison and the selection of the most suitable structure for each unique project. Once the structural system is selected, it is equally important to produce a set of design development drawings indicating the size and disposition of all structural elements. The design development drawings allow ready co-ordination of all design disciplines at the outset of the project and can readily be used for budget purposes.